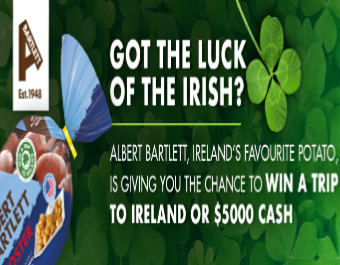 Albert Bartlett St. Patrick’s Day Sweepstakes – Win a trip to Ireland or $5,000! Win a trip to Ireland or $5,000! ENTER SWEEPSTAKES HERE – Albert Bartlett Sweepstakes page. ENTRY LIMIT – Regardless of the method of entry, there is a limit of one (1) Entry per person per twenty-four (24) hour period. SWEEPSTAKES ENTRY PERIOD – The Albert Bartlett St. Patrick’s Day Sweepstakes (the “Sweepstakes”) begins at 12:00:01 AM Eastern Time (“ET”) on Tuesday, January 1, 2019 and ends at 11:59:59 PM ET on Friday, April 5, 2019. WINNER’S LIST – US RESIDENTS: WINNER CONFIRMATION REQUEST: For a written confirmation of the winner (available after 4/8/19), send a stamped, self-addressed envelope (no later than 5/8/19), to: The Albert Bartlett St. Patrick’s Day Sweepstakes Winner Confirmation Request, PO Box 25466, Rochester, NY 14625-0466.